It’s been proven personalised emails get a better response. Or whatever works best for your campaign. And if you’re missing some data, don’t sweat it. You can create defaults like ‘Dear Colleague’, so that everyone is covered. 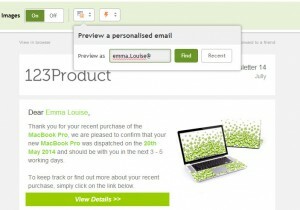 But is it tricky to set up these personalisation fields? Of course not. You can edit them, import them and export them via the address book manager screen. Then whack them in the email via a handy drop-down menu. But make sure you thank your WizBots for all their hard work behind the scenes! They'll work even harder for you with just a little praise.